Rajhans (Desai-Jain) Group – Realty – Blog – Page 3 – Where Luxury is a way of Life. Best Ways to Make Your Home Handy and Roomy! It’s really a challenging task to make your small apartment look big enough. Not only this, there are always must-have things like comforts and space that might be the real challenges. So how would you make the most of your compact apartment so that it can look as roomy as possible? Here are some simple yet efficient ideas that can help you organize your home space to the maximum. In a bid to create a functional space within your room, a light partition wall with beautiful design can work wonder. By doing this, you can easily separate the living room with bedroom without compromising on the beauty of your room. Just try this out and behold your apartment being light and nice. 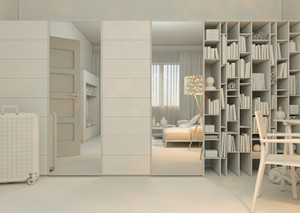 White is not only beautiful but also functional in your compact apartment. The colour white has magic to create a visually-stunning spaciousness. This is the reason why many designers prefer glossy white furniture in our home. Don’t be afraid to install a dinning zone in a small kitchen of yours. You might think that your dinning zone will take up a lot space, but you can always organise it to the best of your space available. What you need is a sleek, compact round table and some little folding chairs around and that’s it! 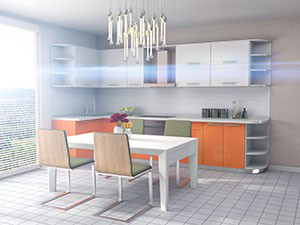 Lighting can be another good thing to give a roomy feel in your home. 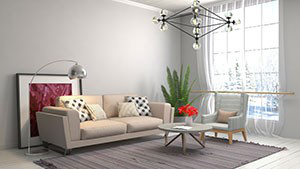 Look for a handy and elegant chandelier which can also go well with other lights such as ceiling lights, bedside lights etc. Installing bookcase is really a very unique as well as creative idea to divide your room into two. 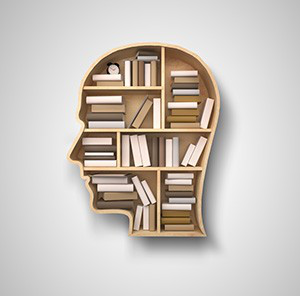 A bookcase surely is an incredibly valuable asset and that’s why it can create that amazing scope in your room. A ceiling rack is so distinctive in itself and also a space saving thing to do in your small apartment. You can always store a variety of things in it. Just hang such overhead racks that can be accessible easily. 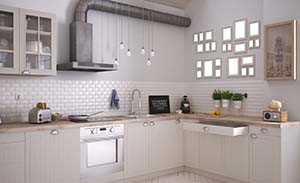 Designing your kitchen wall with small and beautiful tiles not only makes a spacious statement but also looks so stylish. Therefore, always opt for small tiles that can match the rest of your kitchen furnishing so that it can give a generous feel. Without shelve, you certainly can’t work out on space as it is the best small space solution. Installing shelves not only takes up as little space as possible but also it can be capacious like that of a cabinet that might otherwise take up lots of space. Since space is the most important element you should be looking for in your home, you should never compromise on it even when buying your dream home. If you’re the one who never does away with the space, then you can search a range of wonderful residential projects at family-friendly value only at rajhansrealty.co.in. Go on and find the best home for your lovely family. 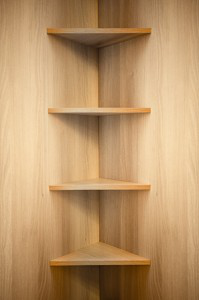 Why Handy Shelves Make A Difference in Your Home? Making anything on your own is always exciting. And when it comes to transforming your lovely home, you should not back down your creativity! 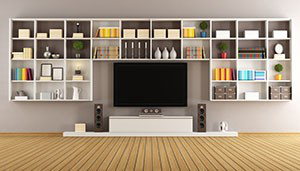 One of the best things which you can do to add value to your home environment is by installing shelves. Such smart structure can work best for souvenirs, books and other small items. Here are some interesting ideas to help create your own shelves. Why not make the most of any corners protruding within your home to put anything that looks really stunning as well as artistic? This sort of shelf can surely save up some space for you too. 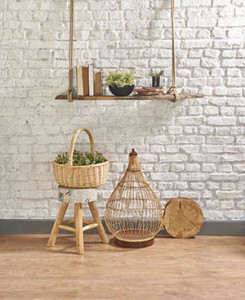 In order to create a stylish hanging shelf, you need a bright piece of lace or string. The best part is that you can hang it in any part of your home. For some creativity is not all about proper organization. All you need is a set of wooden boards and let your free flow of ideas convert into your desired shelves. 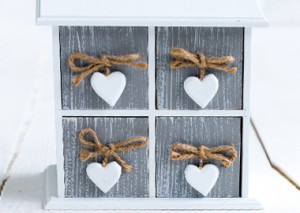 You would just love to adore this beautifully-painted box-shelf on your wall. 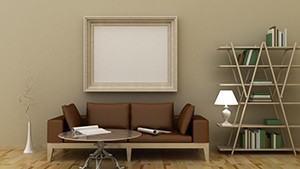 Make sure that you don’t paint more than necessary boxes as this will make your home look quite crowded. 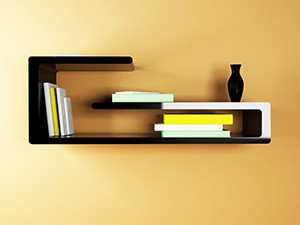 Though this shelf looks simple with sections, but it does gives you quite a many options to put your things in different sections. It’s really a space saver thing you should create in your home. Believe it or not! This bendy shelf looks cool enough. And the best thing is that it’s easy to create on your own. Just invest some time and there you go! Let’s add some natural touch onto your wall. You can hang such shelves in kitchen or bathroom. This branch-style shelf looks not less than any work of art! Always think twice before finding the home that suits your needs as well as gives you all the user-friendliness ranging from elegance to space. If you’re looking for the best home options, just visit www.rajhansrealty.co.in. The Rajhans Realty is one of the leading real estate developers who has so far created millions of square feet across India. Wait no more and just experience your dream home meeting your dreams! We naturally feel too conscious when people talk about us. And same is the case when they react to our home. Of course, we take it too personally, don’t we? No doubt, we groove on appreciation and definitely like to be overwhelmed when they put in a good word about our home. Whether we actually work on the home makeover or not, we do aspire to leave a lasting wow impression on whoever visits us. 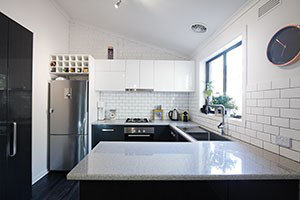 With so many alternatives to choose from, it’s quite a confusing state while opting for the best revamping ideas to add value to your home. Regardless of your budget, what matters the most is how you make the most of each and every item in line with the available space. Have a look at this take on how to master your home interiors while making a statement. Mirrors are great illusionists. And what’s best place than closet doors? Put mirrors on them in such a way as they would totally stand rejuvenating rest of the interiors whilst expanding the appeal of any small room. What’s more you can always decorate your lovely home with small, elegantly-framed mirrors as they are subject to ooze out more liveliness and pulchritude. 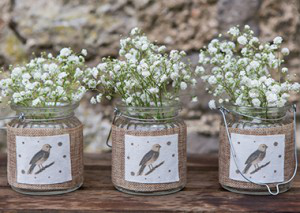 It’s so cute as well as wonderful when you mount a lovely, glossy and glassy jar on the wall. Think of enchanting colours that make your jars no less than a object d’art that not only hold some accessories but it will save up great space of your bathroom and kitchen. Anyway, these beautiful pieces of colourful jars are certainly going to beautify your interiors to the next level, that too in best budget. Lamp sheds look simply stunning. Today they come in a wide variety with amazing patterns and colours so as to go well with your interiors. 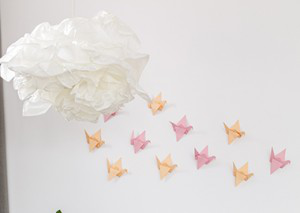 If you like folding papers with magical finish, you can create your own lamp shed origami which will surely dazzle the onlookers. Now that an array of curtain prints are available, you can embellish your plain or tired curtains with some refreshing designs. Elegant curtains surely bring charm in a room while adorning your windows with an illusion of large space and adjoining things, for sure! Then there is more unique use of a curtain tie which also comes in huge varieties. 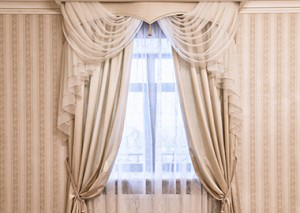 Do not always go for same old steel rod for your curtains as there are plenty of creative rods to try for i.e resembling a branch to any unusual shape and style. Buying a new door is not always a good to roll idea as sometimes small details are all you need to give an impressive look. Be it your cupboard or a bathroom door, the new handles with uniquely perfect patterns will lift up the beauty, overall. Frames are beautiful piece of things. If you place them perfectly, they will dominate the appeal, entirely. 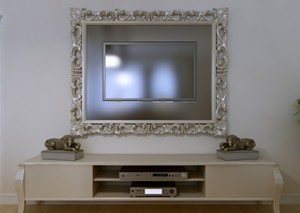 Be it your television, photos or drawings, when framed look so stunning that will catch the eyeballs. 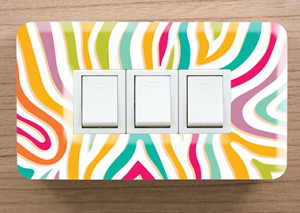 Covering all the switches and outlets with radiant cases looks so nice. This will further keep out the clutter and gives a chic statement. Add to more, wires should also be hid with suitable covers so as to make the wall look bold and spacious. Just don’t simply be afraid of change! 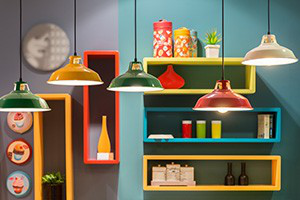 Be it prints or colours, antiques or modern accessories, make up your mind to transform your home as there are a hundred thousand pocket-friendly ways available to embellish it without compromising the look. The textile industry has its roots thousands of years back. According to archaeological surveys and studies, the people of Harrapan civilization knew weaving and the spinning of cotton four thousand years ago. Add to more, a block printed and resist-dyed fabrics whose origin is from Gujarat was found in the tomb of Fostat, Egypt. It hence, proves that Indian export of cotton textiles to the Egypt and other Nile Civilization was huge. As you may know there used be a large export of Indian cotton to the West during 18th century. Textile industry was the first organized industry which accelerated industrial revolution in the 18th century. The apparel industry today has become one of the most leading players across global industrialization and no doubt, it plays an integral role in generating employment opportunities worldwide. Even, the East India Company emphasized the Indian cotton and silk trade that successfully turned into one of the most richest corporations of its era. Today, our country accounts for about 13 % of world’s production of fibre, textile and yarn. In the year 2013, India ranked 2nd in textile and garment export across the globe, outranking Germany and Italy. With plenteous raw materials and workforce, the textile industry in India is the second-largest employment generators after agriculture. It provides direct employment to over 35 million in India. This industry therefore holds an important position in our nation. Since clothing is next to food, the textile industry boasts providing basic necessity and similarly plays vital role in overall economy. When it comes to Textile, there is one city that has been making its mark. Yes! It’s the diamond city which is a great fit for the textile businesses worldwide. For decades, Surat has been the hub of the textile industry which is still famous for its cotton textile, silk saris and gold and silver embossed zari work dating back to the Mughal era. Today, Surat boasts rapidly growing textile industry day by day. And augmenting the growth of such blooming industry, an international-standard textile park, ‘Rajhans Fila’ has been established by a leading conglomerate ‘Rajhans (Desai-Jain) Group. This first-of-its-kind textile park comprises best connectivity options and world-class facilities such as conference hall, restaurant, CETP plan for water jets, hospital, fire station, mini-shopping centre, and eye-catching landscaping to name a few. It just not ends here. There is another such textile park, Rajhans TEXPA which has already set out to revolutionise the widespread textile industry in Surat. Fully-furnished with high-standard infrastructure and guaranteed conveniences, this iconic textile park boasts being an innovative project in itself which is assuredly an ideal platform to achieve rapid progress in the fields of textile. In Surat Textile Market, Federation Of Surat Textile Traders Association (FOSTTA) is an association of Textile Processing units of Surat Textile Market. There are over 60,000 traders and 160 markets associated with FOSTTA. FOSTTA addresses common concerns of these units and take care of presentations and representations on their behalf to several Ministries, Government Departments, Semi Government Institutions and Private Companies. FOSTTA is a common platform for all the processing units of this area for constructive interaction and mutually beneficial policy making that helps keep this happening industry in flow. Santacruz is one of Mumbai’s premium residential areas and is located centrally in close proximity to almost all major areas of the city including the domestic terminal of the Mumbai airport, railway station, Vile Parle, Khar, Juhu, Bandra, Kurla and more. The area is well connected to several places through the Kalina-Kurla Link Road and the Western Express Highway. Needless to say, the iconic and beautiful Juhu beach is also located in close proximity to the area. The area is regarded as an educational hub and is home to a Mumbai University campus in addition to several other reputed institutions such as the R.N. Podar School, St Anthony’s School and the famous St Mary’s High School. Rajhans Otium is a landmark project located bang opposite the Asha Parekh Hospital on the Swami Vivekanand Road in Santacruz. This project offers great connectivity to all major destinations in Mumbai and offers easy access to all necessary social amenities. The project comes with 3 BHK apartments for buyers that are sized between 900 and 930 sq ft on an average. Rajhans Otium comes with several amenites for residents including podium and basement car parking facilities, terrace garden, swimming pool, high speed elevators, RCC structure and many more. The project also comes with top class fittings and fixtures including reflective windows, anodized French sound proofing for windows, Italian marble flooring, wooden flooring in master bedrooms, piped gas provisions and Vastu compliant architectural layouts. You can visit us and look through the pricing options in order to get a better idea of what we can do for you. You can contact us at +91 261 2551129 / 2553307 / 2541456 or desai.jain on Skype for obtaining necessary information on bookings and more. At Rajhans Reality, we are here to make your dreams come true! Ghatkopar is one of Mumbai’s most popular residential and commercial areas. The area boasts of seamless connectivity to several destinations in Mumbai through the Central Railway network. The West section is steadily developing into a prime real estate location. The Jagdusha Nagar neighbourhood has wide roads, proper infrastructure and all necessary social amenities and infrastructures. Helix 3 is a landmark commercial project that comes with ample facilities and amenities for businesses and corporates including car parking facilities, Wi-Fi connectivity, video security systems, intercom facilities, high speed elevators and more. The whole building is centrally air conditioned with attractive glass façade elevation. Floor to ceiling height has also been increased at this project and the building is being developed in partnership with leading engineers. Safety equipment aside, the building comes with the latest fire and alarm systems and there are separate washrooms for offices. The project is set to introduce new benchmarks in terms of office and commercial spaces. The project will also incorporate multi-cuisine restaurants, cinemas, a gymnasium and retail spaces as part of Rajhans’ initiative to add more life to workspaces. However, Rajhans Reality aims to add yet another shining star to the lavish skyline of Ghatkopar West. Work on Rajhans Helix 3 is underway and we expect customers to get possession of their property by the end of 2016. Rajhans’ Helix 3 is a commercial High-Street Multiplex with commercial offices and a state of the art shopping center. The complex is being constructed on LBS Road, at the Old Shreyas Cinema in Ghatkopar West. At Rajhans, we believe in delivering unparalleled convenience to our clients. The shopping centre should be a major attraction for corporate executives working at this project. Another plus is the fact that the building maintains proper safety standards. The latest under construction commercial project in Ghatkopar will have space for retail shops and offices. The area specification for retail outlets ranges from 250 to 10,000 square feet while office space varies from 350 to 7,000 square feet. Having already worked on numerous commercial projects in Surat, we have a distinguished name in the industry. Our work speaks for itself. You can visit our website www.rajhansrealty.co.in and look at the projects that we have already completed in the past to get an idea of what we do. The Rajhans’ Helix 3 will set new standards for corporate and commercial amenities. Since construction is already underway, prospective customers can reach out to 2553307/ 2541456 for swift bookings and other necessary project information.